A void agreement is void ab-initio, in essence, it is null since it is formed. But on the other hand, a void contract is one that is valid at the time of creation but eventually becomes void, due to certain circumstances, which are beyond the control of parties concerned. In finer terms, it can be said that a void agreement, is always invalid, but if we talk about the void contract, is one that is enforceable in the beginning, but subsequently lacks it due to changes in government policy or some other reason. So, here we are going to havein-depthepth discussion on the difference between void agreement and void contract, So, let’s get started. Meaning Void agreement refers to an agreement which as per law, is unenforceable and has no legal consequences. Void contract implies a valid contract, that ceases to be enforceable by law, becomes a void contract, when it lacks enforceability. Void ab-initio It is void from the very beginning. It is valid at the beginning but later on becomes void. Period of validity It is never valid. It is valid, till it does not cease to be enforceable. Causes Due to absence of one of more essentials. Due to impossibility of performance. Prerequisite of contract When the agreement is created, all the prerequisite of the contract are not satisfied, thus making it void. When the contract is entered into, all the prerequisite of the contract are satisfied, which due to certain circumstances, subsequently becomes void. Restitution In general, restitution is not allowed, however, the court may grant restitution on equitable grounds. Restitution is allowed when the contract is discovered as void. A void agreement is defined under section 2(g) of Indian Contract Act, 1872, as an agreement which cannot be enforceable by law, i.e. such agreements cannot be challenged in the court of law. Such an agreement lacks legal consequences, and so, it does not confer any rights to the parties concerned. A void agreement is void from the day, it is created and can never turn into the contract. Agreement with incompetent parties, such as minor, lunatic, alien enemy. Agreement whose consideration or object is unlawful. The agreement which restricts a person from marrying. An agreement where both parties are under the mistake of fact, material to the agreement. The agreement which restricts trade. Example: Suppose, Jimmy offers David (minor) to supply 1000 kg of wheat for Rs 20000, at a certain date in future, but B does not supply the stated quantity of wheat to Jimmy. Now, Jimmy cannot sue David, as David is a minor and an agreement with minor is void ab-initio. Section 2 (j) of the Indian Contract Act, 1872 defines Void Contract as a contract that no longer remains a valid contract and cannot be enforced in the court of law. Such contracts do not have any legal effect and cannot be enforced by either party. Example: Suppose Nancy, a popular dancer contracts with Alpha Company, to dance in a show. Unfortunately, met an accident some days before the event, in which her legs injured badly and not allowed to dance by the doctor. In such a case, the contract becomes void. A void agreement is one, which according to law is neither enforceable nor it creates any legal consequences. The void contract, on the other hand, is a contract which is valid at the time of formation but becomes unenforceable, due to impossibility or illegality. A void agreement is void since it has been created. As against this, a void contract is valid at the time of creation but later on becomes void. A void agreement is never valid, whereas a void contract is a valid contract, till it does not lack enforceability. 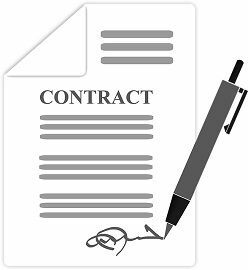 A void agreement is void due to the absence of one or more necessary elements that result in a contract. On the contrary, a void contract is one that becomes void due to the impossibility of performance. The void agreement does not satisfy the prerequisites of a valid contract, and because of this, it is considered as void. Conversely, the void contract is one that fulfils all the requirements of a valid contract, but cannot be enforced due to unexpected circumstances, thus becomes void. Restitution or restoration is not granted in the case of void agreement, although in certain circumstances, restitution is permitted on equitable grounds. On the contrary, restitution is granted to the concerned party when the valid contract, eventually becomes void. Therefore, with the above discussion and example, you might be able to understand the terms in detail. While a void agreement does not create any legal obligation. On the other hand, the legal obligations created during the formation of a valid contract comes to an end, when the contract becomes void.